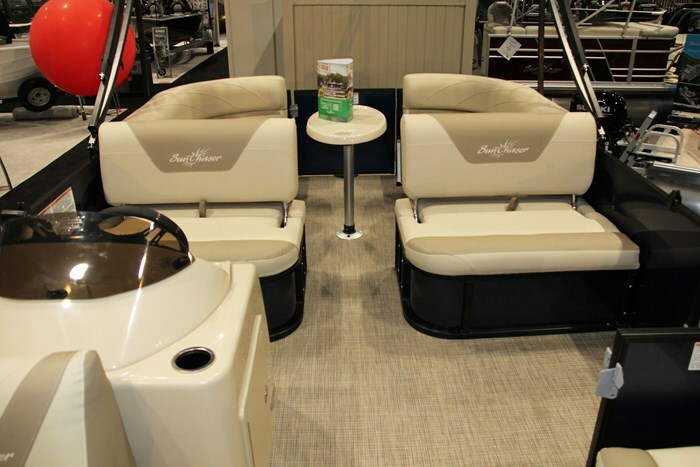 The Geneva Cruise 20 LR Swing Back is one of twelve floorplans in the Geneva Cruise series of SunChaser pontoon boats. SunChaser offers a total of fifty floorplans in eight series from sixteen to twenty-five feet. 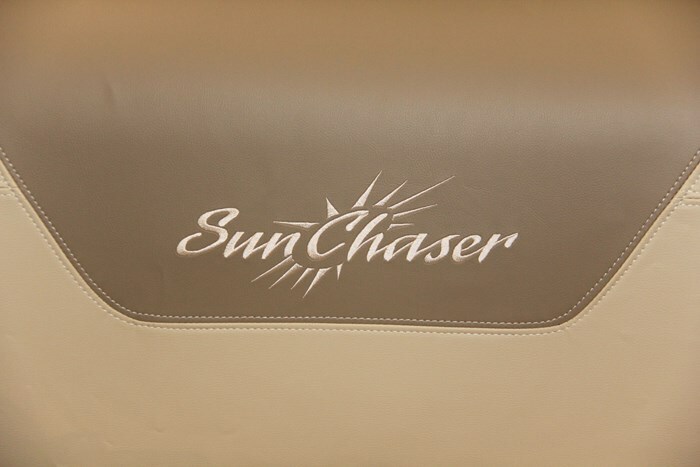 The “Swing Back” descriptor in the name makes this model unique in the entire SunChaser lineup. Both the double-wide fixed helm seat and the double-wide passenger seat opposite it have two-position seatbacks. 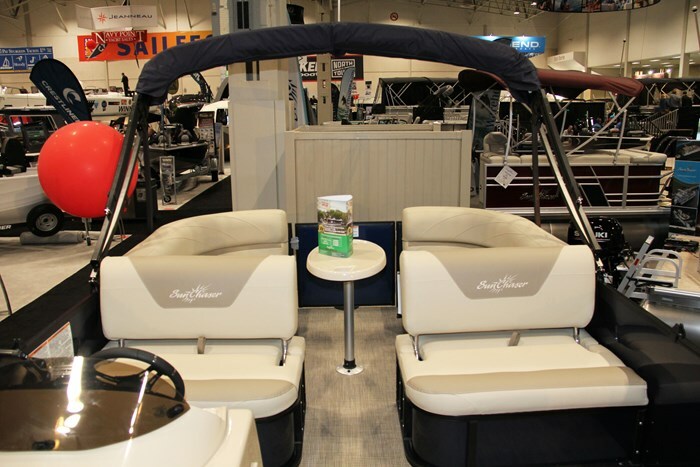 With these seatbacks in their aft position, they allow forward-facing seating or, when the seatback is swung back to its forward position, create an aft-facing seatback to facilitate stretch out lounging utilizing the port and starboard rear lounges. Neat! There are four of these comfortable two-person lounges; one in each corner of the deck leaving enough room for both a bow and a stern deck platform on this (almost) twenty-one footer. A five-step aluminum boarding ladder is standard on the stern platform. Three thirty-inch wide entry gates, one each centred in the bow, stern, and port side are provided. All four lounges have Rotocast bases with storage beneath the seat cushions. 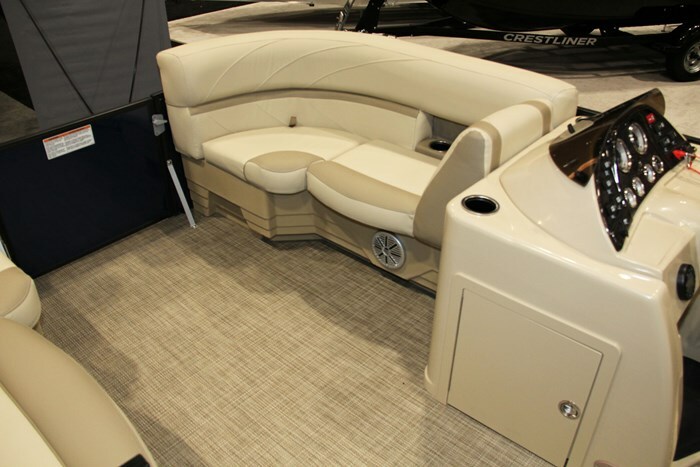 A lounge arm pop-up change room is provided standard as is 22-ounce carpeting on the interior floor with vinyl on the floor of the stern platform. An elliptical table with molded-in cupholders is provided with a floor-mount base centred between the two aft lounges. 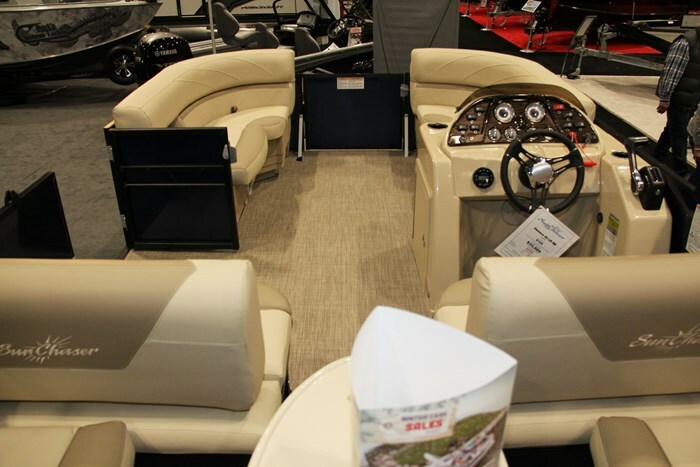 The starboard side fibreglass driver’s helm console comes standard with a sporty Gucci Verona steering wheel, windscreen, 12-volt receptacle, a Jensen MS 3A Bluetooth compatible stereo with MP3 port, and space within the console to store a portable cooler. Docking lights are standard as is an eight-foot, six-inch colour-coordinated bimini top. A pair of 25-inch diameter tubes is standard and you can select from eight choices of exterior fence colours. Outboard power from your choice of Mercury® FourStroke or Evinrude E-TEC® up to a maximum of 125 horsepower can be selected for the standard two-tube setup. 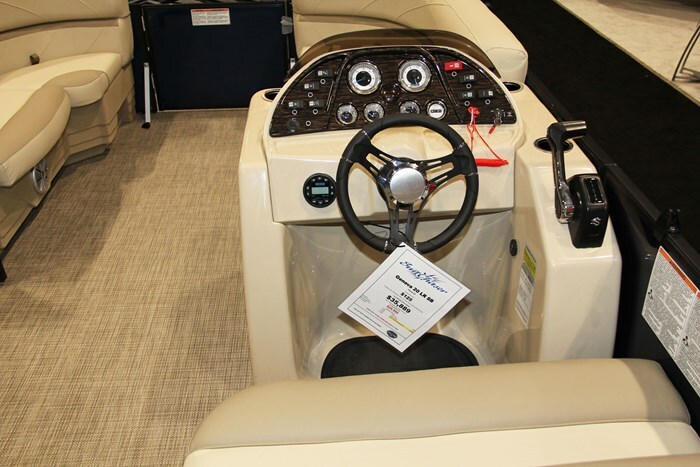 There is an extensive list of available optional equipment and features from which to choose to allow you to personalize your Geneva Cruise 20 LR Swing Back precisely the way you want it in order to maximize your boating enjoyment. To maximize your boat’s performance, choose from a selection of individual tube and performance upgrades such as a round or a twenty or twenty-five inch center tube with performance shield, X-treme Performance Strakes, a PTS tube, etc. Alternatively, you may wish to select one of four Performance Packages which will include some of the above upgrades and more. If you do a lot of running in big water, then you may want to add the Big Water Edition Package of tube, keel, and fin upgrades. Some of these tube upgrades will increase the maximum rated horsepower of the boat up to 250. Some notable individual available options include complete vinyl flooring with or without snap-in carpet, three choices of “Weave” flooring or synthetic teak flooring. The third tube will get you a larger size fuel tank or you can order a 40 or 60 gallon tank separately and it comes with a waterski pylon. You could instead order a deck or underdeck mount ski tow. The in-floor storage compartment is ideal for watersports accessories but it requires the addition of the third center tube. To maximize onboard entertaining, choose the extra table kit, the cooler table, and the 30-inch gate seat to convert the bow area into one giant U-shaped seating area. Then add the stainless steel grill and the stereo upgrade to a Kicker KMC10 with Bluetooth capability and rear-facing speakers. Consider adding the Porta-Potti option. At the helm, Extreme, Sea Star hydraulic, or power steering assist come highly recommended and then add useful gauges such as trim and depth or a GPS speedometer and/or the inclusive Gauge Package. A ram-mount Humminbird Piranah MAX 4 screen is also available. A comfortable high back captain’s chair with armrests is available to replace the driver’s side Swing Back bench seat. An Executive Helm Package includes many of the above upgrades plus it adds an Executive Console with raised platform and lighting plus a tilt steering wheel. 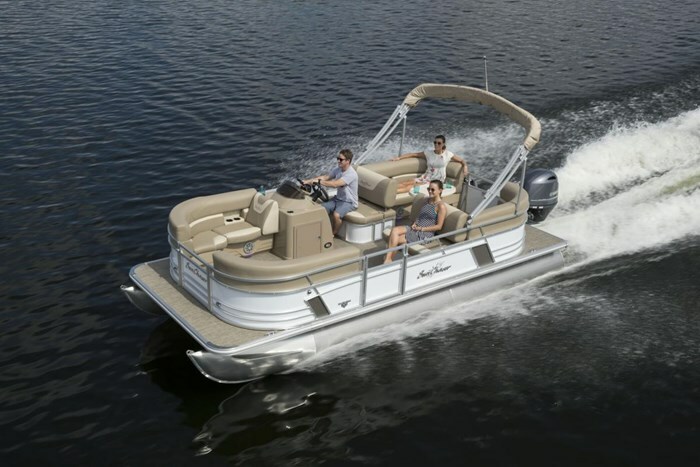 Other upgrades include underwater lighting, Babbito underdeck lighting, a dual battery system, raw water washdown, and canvas upgrades including a ten-foot bimini, double top, power canopy, half or full camper, and playpen cover. 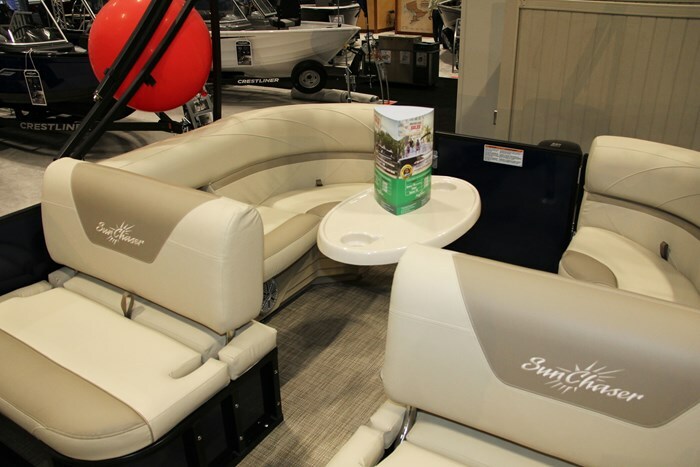 This SunChaser Geneva Cruise 20 LR Swing Back not only offers a unique seating arrangement but also the capability to outfit it with almost every convenience you could ask for in order to satisfy your every on water desire.